Information on using a CoSHH cabinet. Below we attempt to explain what a CoSHH cabinet is and how to use a CoSHH cabinet. Consequently storing substances in a CoSHH cabinet, and most of all, which type of CoSHH cabinet you need. If you would like any further assistance, please do not hesitate to contact us. CoSHH Cabinets or Dangerous & Flammable Substances Cabinets, among others, are purpose made cabinets designed to meet the requirements of the Control of substances hazardous to health regulation. They store and contain hazardous substances in the workplace. Their purpose is to restrict access to substances used in the workplace which may be a hazard to health. This is done using a designated highly visible and identifiable lockable steel cabinet. The cabinet must be capable of safely storing containers of hazardous substances and in the event of a stored container being damaged, contain 110% of the contents of the largest container store in the cupboard. When storing substances in a CoSHH cabinet ensure that care is taken not to store incorrect substances together in the same cabinet. Items such as cleaning products, detergents etc. are not to be stored with flammable substances such as petrol. In instances and workplaces where these types of substances are used then two separate CoSHH cabinets must be used. This will differentiate between the types of hazardous substances stored in the CoSHH cabinets. CoSHH cabinets are designed to store substances which may be a hazard to health in the workplace. The storage of such hazardous substances within a CoSHH cabinet allows for their use to be monitored and access to them restricted. It also identifies that hazardous substances are stored within the cabinet. Each CoSHH cabinet should be clearly marked with the appropriate warning label. A CoSHH cabinet should be fitted with a lock to which only predesignated key holders should have access. It should be locked at all times when not in use for removal and replacement of hazardous substances. No hazardous products or substances should be left out when not in use. Which type of CoSHH cabinet do I need? The type of cabinet required is dependent upon the type of hazardous substances used within the workplace. CoSHH cabinet. General hazardous products. Acids and Alkali. Acid and Alkali based products and substances. Dangerous and flammable. Petrol, thinners and general flammable substances. Substances used in Agriculture and horticulture for peat control ect. Cabinets within each category are available in three sizes to cater for a variety of differing workplace requirements. 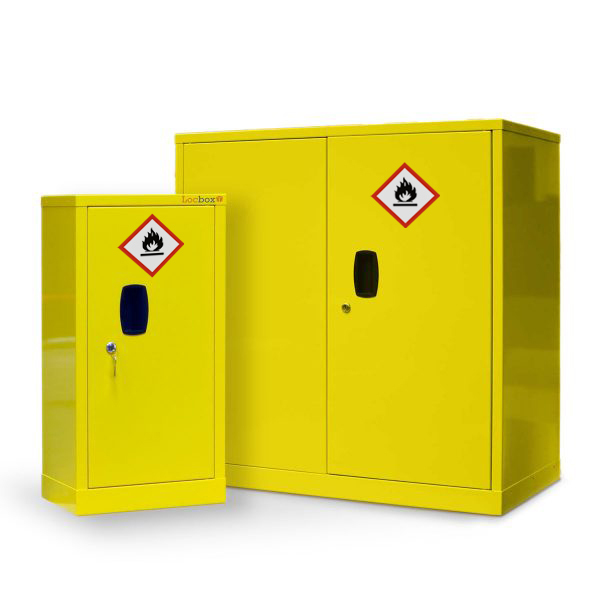 Each of our cabinets are constructed similarly but identified differently to enable the hazardous substances stored within to be easily identified. Each of our types of CoSHH cabinets are labeled with the correct corresponding hazardous substance label and have the required sump to collect any spills.